Departement of Vaucluse - Pop. : 10.000 h.
On the D941 which links the N7 (Paris/Marseille) in Nyons (Drôme). 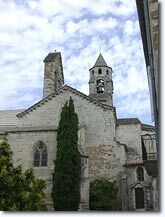 Valréas is the capital of the "Enclave des papes". 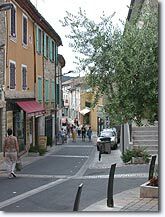 This commune is found in the département of the Drôme while at the same time belonging to the département of the Vaucluse. 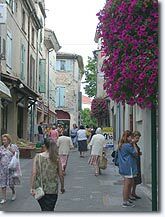 Situated on the left bank of the Coronne river, Valréas is an important agricultural and tourist centre. 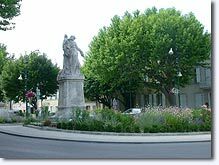 Classified as a "station verte de vacances", the village is surrounded by renown vineyards and visitors are invited to discover its rich history. 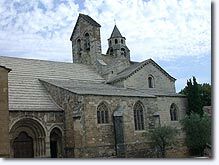 Valréas is dominated by the 12th century Château Ripert tower and by the imposing 12th century Roman church ND de Nazareth. 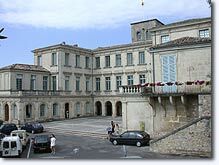 You can visit the château de Simiane, today transformed into the town hall. A number of prestigious art exhibitions are held in this magnificent building (17th and 18th century). The château also houses a superb collection of rare books, including some works dating back to when printing was first invented, before 1500. 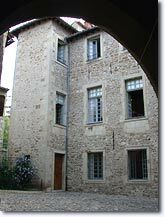 Those who are interested in printing and publishing may also like to visit the "musée du cartonnage et de l'imprimerie" and the printing press. The museum retraces the three stages in the printing technique and explains the manufacturing process of cardboard boxes, beginning in the 19th century. It must be said that today Valréas is the leader of the cardboard industry in France... they know what they are talking about! Valréas has a number of beautiful old houses. 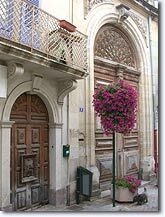 Built in the 17th and 18th century, they are found in the Grand'rue, la rue de l'Horloge and the rue de l'Hotel de Ville. 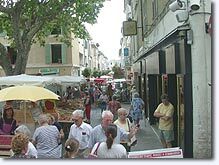 If you do not like crowds, avoid Valréas from June 23-25... while on the contrary, if you like festivals, music and dancing, come to the "fete du petit St Jean" where more than 350 people in traditional dress parade through the streets. At the beginning of August you can also take part in the famous "corso de lavandes" and of course at Christmas, you can see the huge Provencale creche at the church ND de Nazareth. 12th century Château Ripert tower. Church ND de Nazareth. 12th and 13th century Château de Simiane. 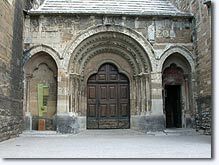 Chapel des Pénitents Blancs et Noirs. Tours des Cordeliers, tour du Tivoli. Musée de l'imprimerie et du cartonnage. Hiking, horse-riding and mountain biking (guided routes GR 9, Bornes papales). Outdoor swimming pool, tennis, archery, fishing, pétanque, and cinema. Enjoy reduced price by announcing the promo code "ProvenceWeb"
Grillon (5km), Visan (9km), Richerenches (7km).